Cordero, G. & C.M. Berns. 2016. A test of Darwin's "lop-eared rabbit" hypothesis: trait covariance due to phenotypic accommodation? In press: Journal of Evolutionary Biology. Integration of developmental biology within modern evolutionary thought has motivated novel theories on and reinterpretation of phenotypic accommodation, which predicts trait covariance due to a novel developmental input caused by genetic change in one trait but not the other. For instance, Darwin's demonstration of developmental plasticity in the "lop-eared" breed of the domesticated rabbit provided a striking example of this. He showed that artificial selection for disproportionately long external ears induced non-adaptive variation in the neighboring auditory meatus. He hypothesized that non-adaptive variation in skull morphology was likely a consequence of artificial selection for increased external ear length in lop-eared rabbits. Although Darwin's observations have been interpreted as evidence of phenotypic accommodation, similar patterns of trait covariance have not been described in nature. 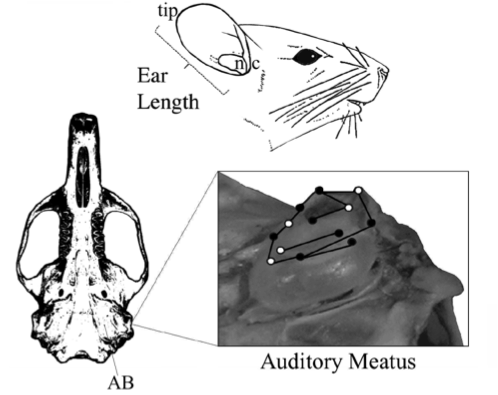 We studied natural populations of woodrats ( Neotoma ) that have likely undergone selection for long ears to test the prediction that ear length is correlated with shape of the auditory meatus, i.e. Darwin's "lop-eared rabbit" hypothesis (See Figure 1). Whether long ears provide a selective advantage by improving thermoregulation or sound perception has not been clearly demonstrated in free-ranging rabbits. Even if adaptive to locomotor performance, functional trade offs would render exaggerated ear length maladaptive in nature. Figure 1. 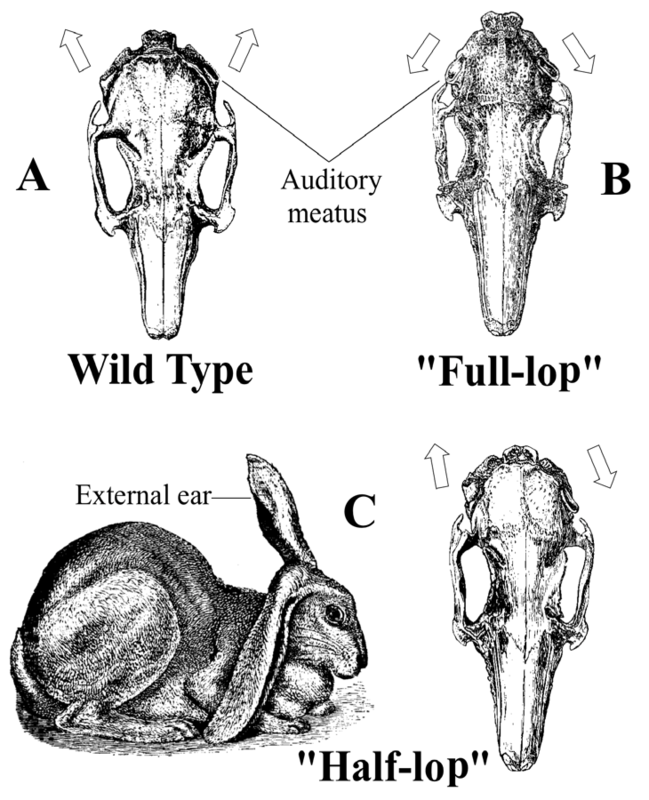 Dorsal skull views of domesticated rabbit (Oryctolagus cuniculus) (A) and lop-eared phenotype ("full-lop" variety) (B) labeled with the auditory meatus. Lop-eared rabbits could be selected for left-right asymmetry in external ear length, as demonstrated by the external ear and auditory meatus on the "half-lop" variety (C). Arrows point in the direction of shape change in the auditory meatus of wild type versus lop-eared varieties. Images were modified from Darwin (1868). Worldwide, unrelated lineages of extant and fossil desert rodents exhibit a pattern towards enlargement of auditory structures. In agreement this adaptive trend, an inverse relationship has been demonstrated with aridity and size of bony auditory structures of woodrats ( Neotoma) Thus, this system is ideal to test Darwin's "lop-eared rabbit" hypothesis. Herein, we combined traditional morphometrics with modern landmark-based geometric morphometric approaches to test Darwin's assumptions on natural selection and phenotypic covariance. In the present study, we generated new data on adult Neotoma cinerea (bushy-tailed woodrat) specimens sampled along an aridity gradient in northern California, where lush coastal forests are contrasted sharply with arid ecosystems of the continental interior and specimens were assigned to nine coastal and 21 interior localities (Figure 2). We examined ear length (EL) using field-collected measurements listed on museum specimen tags and accounted for body size in all analyses. The ventral skulls of 37 specimens (coastal = 18; interior = 19) were photographed for landmark-based geometric morphometric analyses on shape (See Figure 3). Figure 2. 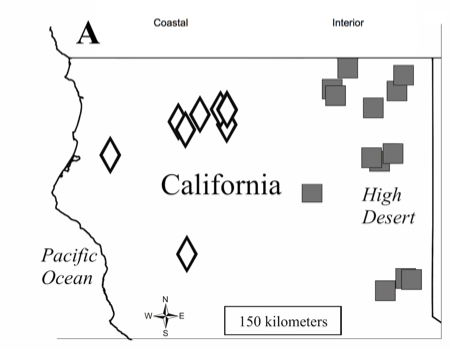 Map indicating localities where specimens were collected for this study. Once size and shape information was collected and analyzed, we found that pattern of phenotypic covariance that closely mirrors a classic Darwinian example concerning domestication and natural selection, and corroborates the modern concept of phenotypic accommodation. Surprisingly, we showed that mean shape of the auditory bulla did not differ in coastal versus interior woodrats and there was no correlation with external ear length. Our results corroborate key predictions of phenotypic accommodation theory: adaptive change in one trait, ear length, is feasible presumably due to natural selection, which may induce non-adaptive variation in a structurally related trait, the auditory meatus, via developmental plasticity. Crucially, genetic accommodation differs from phenotypic accommodation in that it describes scenarios in which, for instance, two covarying traits have undergone evolutionary change in their underlying developmental genes due to a novel environmental input. Our results are the first to support a classic Darwinian example concerning natural selection and phenotypic covariance, and we propose that shape variation of the auditory meatus is induced, at least partially, by physical impacts exerted by the external ear.